Rabid stray dogs have ripped up and eaten 13 rare animals in the largest Bulgarian zoo in Sofia. 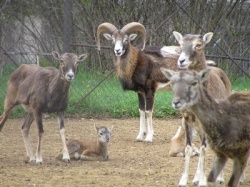 A total of eight mouflons, four fallow deer, and one doe have been torn to pieces by several stray dogs, the Director of the Sofia Zoo, Ivan Ivanov, announced. The incident happened last weekend but was not made public until Friday. At 7:30 on Sunday, January 24, 2010, several veterinarians discovered six rabid dogs in the moat of the fallow deer space in Sofia Zoo. The rabid stray dogs were picked up by the Sofia Municipality firm, Ekoravnovesie. “Don’t ask me how I felt when we were removing the remains of the killed animals. I just cannot overcome what happened. I now come to sleep every night in my office here in the zoo in order to guard the animals,” Director Ivan Ivanov told the Monitor Daily. In his words, the rabid dogs got in the zoo through a low part of the fence where the zoo borders on a privately-owned parking lot. He has no explanation of why the guards from the private security firm which is supposed to guard the zoo, let this incident happen. Ivanov vowed to hold the firm responsible because the incident occurred at around 3 am, and there must have been lots of noise. Yet, none of the guards reacted. “Several years ago we used to have our own dogs that we took good care of, and they guarded the territory of the zoo, and did not let any intruders to the cages of the animals. Unfortunately, we were made to remove them because some of the visitors were afraid of them. As a result, we have seen a great number of stray dogs trying to enter the zoo as they are attracted by the food that we give to the animals, and the visitors who feed them,” the Sofia Zoo Director said adding that it was probably the extremely cold over the last weekend that drew the stray dogs to attack the zoo deer. Ivanov says the losses are incalculable for the zoo as the mouflons and the fallow deer are rather expensive animals.